Discovering new worlds is fun. If you'd like to see the other posts about doll quilts here on Maida Today, click here. 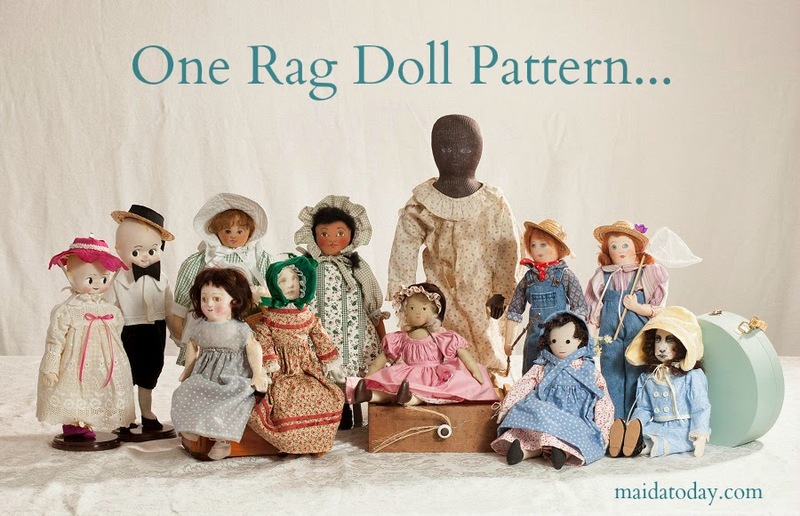 In this post, I'd like to focus on resources for making antique inspired doll quilts. I love quilts, but making a large sized quilt is beyond my attention span. But making a doll-sized quilt would be just right! Visit Edyth O'Neill's blog, she's got a lot of doll quilt pictures up right now. 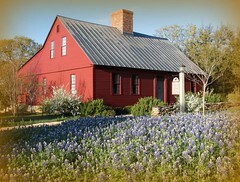 The pictures of Martha Rutledge's quilt reminded me of how I came to discover some resources about making doll quilts. I oohed and ahed over a picture Edyth shared via email of a quilt that Martha Rutledge had made. When I mentioned I would like to make a doll quilt, Martha recommended the Small Quilt Talk group. The Small Quilt Talk group is led by Kathleen Tracy, and is to small antique quilts what Maida Dolls Group is to antique dolls. Kathy has written several books about making small quilts, and one book in particular is focused on American Doll Quilts. You can learn a lot about making doll quilts from Kathy's group and books. Also, visit Kathy's website Country Lane Quilts where she has a where she has some free antique inspired doll quilt patterns. Kathy also has a blog here called A Sentimental Quilter. In addition to Kathy's books and resources, there are some other wonderful blogs and resources. First off, don't forget about antique doll quilts themselves as inspiration. Here are some links to antique doll quilts available for purchase. There are some great gems published in the past. Amazon has a great list of books to try. There are a lot of wonderful sites on the web. I picked a few here that are either focused on doll quilts, antique quilts or have great links lists related to our topic. Visit these blogs and then look at the links they have on their blogs. You'll find some great resources! 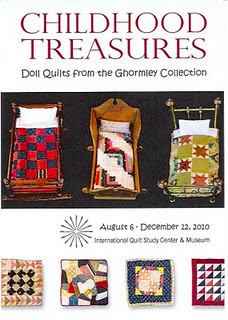 Barbara Brackman has a great post about the Ghormley collection of doll quilts here. Dawn, of Collector with a Needle (great name!) has a wonderful post on doll quilts with pictures of a special exhibit of doll beds and quilts at the International Quilt Festival in Houston. The Exhibit, called "Sleep Tight Doll Quilts" showcases a number of new doll quilts. Visit Dawn's blog to see some wonderful doll quilts shown there with links to other sites on doll quilts. Inspired by Antique Quilts blog has made her own version of the wall of doll quilts above. It is so inspiring to see someone follow through on that inspiration! Lisa's site Stray Threads isn't focused only on doll quilts, but has an incredible links list to other quilting sites focused on antique quilts. Her blog archives are worth looking through because she has a great passion and knowledge for early quilts and other textiles. Only Doll Quilts site is of interest for obvious reasons! Marian Edwards Dreamsweaver has a great blog showcasing some quilts she has made. Amy Champions blog has a lovely doll quilt in process called Strawberry Fields. 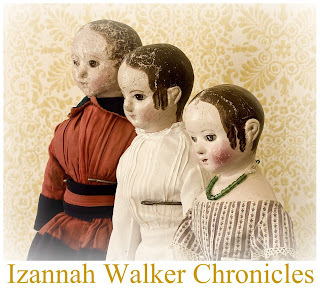 Humble Quilts has a lovely post showing some antique doll quilts which inspired new doll quilts made as reproductions. Ashton House has a lovely post on the Ghormly collection. Inspiration for color and pattern can be found through studying antiques. Of course, we always sign our work so as to not confuse any collectors. I hope that this post has been helpful to you and FUN. If you're a doll quilter, please leave comments below so we can visit your sites AND leave suggestions for resources I didn't list here. See all the Doll Quilt posts here on Maida here! Thanks for mentioning my blog on your site. I've really enjoyed your blog!! on my wall, it truly is inspirational to see them together like this. anyone can do it! just keep making those doll quilts!